The Center for the Study of Women, Science and Technology (WST) continues its program to support and to fund partnerships of undergraduates with faculty in research on women, science, and technology. Georgia Tech faculty who serve as WST mentors may apply for funds to support designated undergraduates pursuing research. Contact Dr. Mary Frank Fox for more information. WST Learning Community residents may apply to Dr. Carol Colatrella for WST funded undergraduate research partnerships to work with WST mentors or with other Georgia Tech faculty. 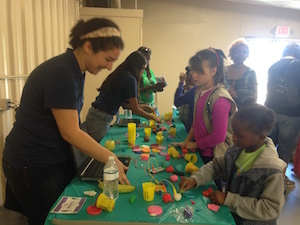 Stempower is a mentoring program offered by Georgia Tech women students that encourages girls to explore STEM and learn key character values. Partnering with the Girl Scouts of Greater Atlanta, two Stempower mentors meet bimonthly with fourth- and fifth-grade girls in a given troop. Stempower has become one of the outreach initiatives of WST with eight Tech mentors and 100 Girl Scout mentees in the U.S.